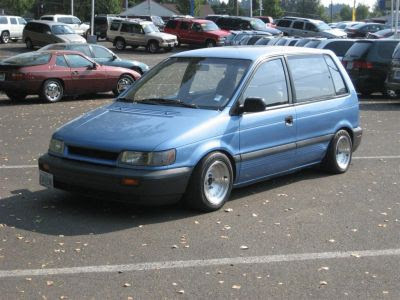 As you may know, my first car was a 1992 Mitsubishi Expo LRV. 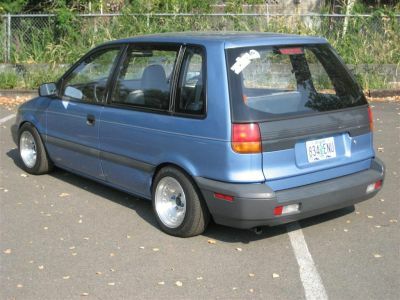 I've had a fondness for them for a long time, and always dreamed of buying another one, slamming it, putting on some cool wheels, and doing a 4G63T swap (e.g. a turbo Eclipse engine). This vehicle above has the wheels, the "slammed," and "a swap." A couple weeks ago, this car was offered up as a private party sale. The seller said it was on cut springs (:sadface:), had custom wheels (which are pretty sweet, IMHO), had a 1.8-liter Eclipse swap (not sure why you'd swap that in except it was likely inexpensive), and had a few transmission issues. The price was around what it is now: $1,850. Now, the vehicle is up for sale at a used car lot. If I didn't already have the project car I have now, I'd actually be tempted to get this and start that crazy-bizarro project car I'd always dreamed of. Alas, a "Tall Wagon Warrior" project will have to commence at another time. Everytime I look at this thing it makes me want to spend money on it, though. Damn me and my lust for the strange cars. Truly, first love never dies. You should go for what you planned. Wish I could buy it, but transmission problems are no joke. Awesome I am buying those rims for my Colt vista. Can't wait mines red tho.